Cambodia is a Buddhist nation located in Southeast Asia, a former colony of France. Most of the people are of Khmer origin and speak Khmer. Cambodia is a poor country but the economy is rapidly growing. Textiles form the majority of Cambodian exports. Cambodia is probably best known for the beautiful temple of Angkor Wat, a popular tourist destination which very unusually even appears on the Cambodian flag, or perhaps the Cambodian civil war (1970-1975), followed by the deadly Khmer Rouge regime of Pol Pot. Cambodia used to be one of the most landmined countries in the world, which has lead to a significant amputee population. The country still has major human rights issues and corruption levels are very high. Deforestation is also a big problem. Dance is an important part of the culture. Volleyball and football are the most popular sports. Cambodian cuisine is quite similar to Vietnamese, with also some Thai and Chinese influences. Chili, however, is not used much. Instead Kampot pepper (a variety of black pepper) is used to add heat. Foods tend to be fragrant, with spices like shallots, ginger, galangal, cardamom, tamarind, cilantro, lemongrass, lime leaf, as well as other dry spices and more exotic herbs. Some dishes are garnished with fresh ingredients similar to Vietnamese dishes. Prahok is a fermented fish paste used as a very popular seasoning. Preserved lemons are used in some dishes. Rice is an integral part of the cuisine is eaten in different ways: normally cooked, sticky rice, rice noodles, savory porridges and rice cakes. Fish is eaten much more than other types of meat, eggs are also popular. Like in Vietnam, the main influence left by the French is baguettes, still very popular. Fruits are also very highly valued in Cambodia, including many varieties unknown in the West. I found a large can of banana blossoms for quite cheap (1.50 e) at a normal supermarket, so I couldn’t resist it. Internet informed me that banana blossoms are somewhat similar to artichokes. (They don’t taste anything like bananas.) So I decided on this salad. Unfortunately I didn’t find the blossoms very special, mostly tasting of canning brine with a grayish pale pink color. Fresh ones would no doubt be better, but are hard to find and require a fair deal of preparation. Other than that the salad was quite good, even my picky sister liked it. The dressing, however, mostly tasted of shallot. The coriander root was quite expensive and you can probably leave it out, I used it but it didn’t seem to add much. I only had orange bell pepper and orange tomatoes, which I must admit didn’t make for the fanciest presentation. Put all dressing ingredients into a food processor and process into a fine sauce. Add more water if it’s too thick. Squeeze the water our of the banana flower and mix with the other vegetables. 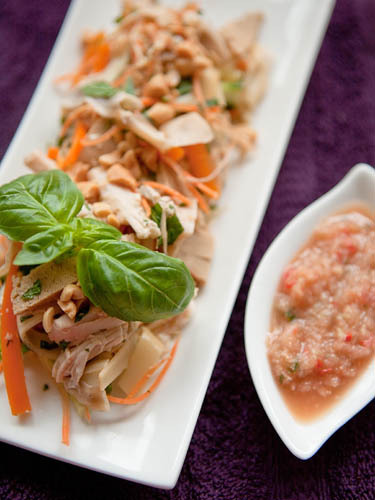 In a large salad bowl toss all the vegetables, mint and basil together with the “chicken”. Add 1/4 cup of dressing and toss. Add more if needed. Sprinkle with peanuts and green onions and serve immediately. Makes about 4 portions. This entry was written on October 19th, 2015 by Maija Haavisto and filed under Asia, Salads.